Two stunning treks amidst the breathtaking scenery of Nepal’s most famous mountain areas, staying in super comfortable lodges. It was a wonderful experience. I particularly liked the scenery, company, leadership and the friendliness of the Nepali people. The comfort of the en-suite facilities in the lodges were greatly appreciated. Lodges were fantastic with hugely friendly staff. Ker & Downey lodges were exceptional – excellent food and service and very clean and nicely kept gardens. The combination of Annapurna and Everest made this a perfect blend of trekking, scenery, challenging walking and great accommodation. Together with this and perfect weather, we were blessed with the most amazing holiday experience. The views of Mount Everest were spectacular and you can really feel the history of the place. Awesome! We have returned feeling both privileged and energised. and the group of 11 people were extremely good company. On this fantastic holiday you will experience the thrill of trekking in two of the most beautiful regions of the Himalaya. The Annapurna massif and Everest’s Khumbu region are home to some of the most celebrated peaks in the world and you will explore both whilst staying in the best accommodation available. These luxury lodges offer the highest standard of service with delicious food, en suite rooms, hot showers and delightful landscaped gardens where you can enjoy stunning views of the surrounding mountains. Your holiday begins in the 5-star splendour of Dwarika’s hotel in Kathmandu from where you fly west to Pokhara to start your four-day trek through the scenic foothills of the Annapurnas. Home to the renowned Gurkhas, the scenery here is a mix of verdant forests, pretty pastoral farming land and steep terraced countryside dotted with attractive villages, all with wonderful views of the Annapurna range. After this easy paced trek you have time to relax at your attractive hotel in Pokhara before returning to Kathmandu. Next you fly to Lukla for a six-day trek through the more alpine-like scenery of the Khumbu region. This is the home of the welcoming Sherpa people and you will visit their main village, Namche Bazaar, before trekking on for breathtaking views of Everest from famous Thyangboche Monastery at 3,863m/12,674ft - literally the high point on your trip. Throughout this Everest trek you will be surrounded by dramatic mountain scenery and iconic peaks that provide a fitting climax to this magnificent trekking holiday. Meal arrangements: Bed and breakfast in Kathmandu. All meals included whilst on trek. Fly to Pokhara in the Annapurna region. Trek to Birethanti. Trek to Ghandruk and on to Majgaun. Trek to Damphus, then continue to roadhead. Drive to Pokhara. Fly to Kathmandu. Afternoon at leisure. Fly to Lukla in the Everest region. Trek to Monjo. Trek to Namche Bazaar and Tashinga. Trek to Thyangboche. Return to Tashinga and back to Lukla. Fly to Kathmandu. Half day sightseeing tour and time at leisure. 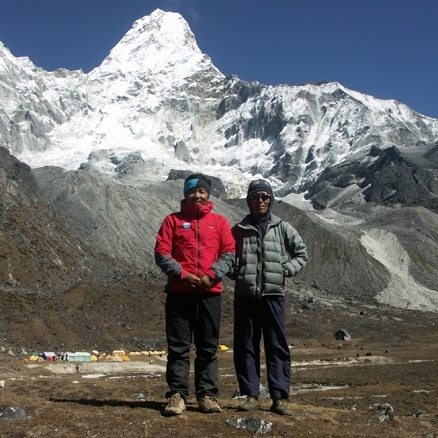 Our Nepal 'lodge' treks are led by professionally-trained English-speaking Sirdars. They have an intimate and expert knowledge of the trekking regions of Nepal and will make your trek a memorable experience. Fly overnight from London to Kathmandu. Day 2 - Arrive Kathmandu. Group transfer to hotel. On arrival you will be met and transferred to Dwarika's Hotel. This wonderful hotel is quite a local institution and is a great favourite with all our clients. It is built in local Nepalese palace style and features many architectural relics rescued from palaces and temples in the valley as well as Nepalese furniture, carvings and statues. The hotel has a pleasant courtyard garden with a swimming pool, a bar and a couple of excellent restaurants. The Toran Restaurant serves very good continental, Indian and Nepalese food while the flagship Krishnarpan Restaurant is a superb restaurant where you can enjoy a multi-course menu of real Nepalese food served in traditional style and surroundings. Day 3 - Fly to Pokhara in the Annapurna region. Trek to Sanctuary Lodge, Birethanti, 1,015m/3,330ft - 4 hours. This morning you will be transferred to Kathmandu's domestic airport for the short flight to Pokhara, 827m/2,730ft, Nepal's second city. This is an exciting flight in its own right, passing over the terraced Himalayan foothills, with views of the great Himalayan range to the north. On arrival you will meet your guide and will have a quick trek briefing before you board your transport to drive the short way to the starting point of your trek. Firstly you travel along the fertile Seti River valley and then the road climbs to a ridge top to arrive at the village of Lumle, 1,494m/4,900ft, which you reach in about an hour from Pokhara. Your Annapurna trek starts here. You set off along a well-paved path, with views of the mountains to the north and the expanse of the Pokhara valley down to your left, climbing gently up past terraced fields to reach the little village of Chandrakot at 1,555m/5,100ft, after one hour. This is a good place to take a break, sitting on the shaded terrace of the Mountain View Café, enjoying the spectacular panorama of the valley below. It is a place to eat your packed lunch. (Note: this packed lunch is provided to give flexibility in case your flight from Kathmandu is delayed, which does happen occasionally.) In Chandrakot you may get to meet the ex-Gurkha owner and hear about his military exploits and those of his father, who won the Military Cross in World War One. From Chandrakot your path drops steeply down towards the Modi Valley, through sparse forests, passing occasional rhododendron or tall stands of bamboo and crossing agricultural terraces. It is all very peaceful with the calls of birds echoing from the surrounding hillsides. After another hour you come to the charming village of Tamijung, 1,371m/4,500ft. Here the houses have intricately carved wooden eaves and window frames and you may see unusual cylindrical beehives suspended on the sides of the houses, awaiting the time when the bees will be smoked out and the honey extracted. The fertile terraces around the village support a variety of crops, including maize, as well as orchards of orange and banana trees. Your path continues down to where you cross the grey-green waters of the Modi River by a cable bridge. Then it is a gentle walk to the Sanctuary Lodge. The lodge is set on a spur overlooking the River Modi. It has a comfortable central lounge and dining area with a reference library. On arrival you will have the afternoon to relax in the lodge's attractive gardens with its darting birds and extravagantly-coloured butterflies or you might take an optional guided afternoon walk to the nearby village of Birethanti with its paved streets, riverside cafes and waterfall. Later, after a three-course supper around the large dining table it's off to bed, lulled to sleep by the rushing waters of the Modi River. Day 4 - Trek to Himalaya Lodge, Ghandruk, 2,012m/6,600ft - 5-6 hours. After a good breakfast you leave the lodge and walk briefly back along the Modi River valley before beginning the long climb to Ghandruk. This is a long climb but you may take your time and there will always be interesting things to see along the way. Before departure from Sanctuary Lodge you will be given snacks such as a sandwich, fruit and chocolate to keep you going on your walk and you will then have a more substantial late lunch of hot soup and fried rice when you arrive at the lodge in Ghandruk. Steep steps lead across fertile terraces and up into forests of rhododendron and oak. All around are the friendly people of the foothills, tilling the fields with their buffalo-drawn ploughs and you will share your path with their cattle and flocks of goats. From the trail you have splendid views across the terraces to the River Modi far below. Walking through villages gives a fascinating glimpse of Nepalese life with families using traditional tools to pound corn, weave cloth, re-thatch their roofs and build neat dry-stone walls. After three hours, you pass through the village of Kimche, 1,554m/5,100ft, where you will have a spectacular view showing you the impressive height you have gained since leaving the river bank. You continue on your way to Ghandruk with several level sections where you can look down over the terraces and villages far below, as hawks swoop and soar on the air currents rising from the valley. After two more hours you reach Ghandruk's welcoming arch and a final climb up through the village streets brings you to the Himalaya Lodge. Sitting on the lodge's terraced lawn, encircled by mountains and with a refreshing glass of lemonade in your hand, you can congratulate yourself on achieving this steep day's climb. The Himalaya Lodge is constructed around a 19th century Gurung village house and has a dining room and an area where you can relax around an open fireplace. There is a pleasant wing with a veranda where the bedrooms are found. Here, all around, you will find clues to the connections of Gandruk village with the Gurkha people and soldiers. Day 5 - Trek to Majgaun, 1,400m/4,620ft - 5-6 hours. After watching the sunrise illuminate the surrounding peaks, including Annapurna South and Machhapuchare, you enjoy a leisurely breakfast on the lodge lawn. Then you retrace your footsteps out of the village and descend to reach a landslip and the remains of bridges washed away by previous monsoon torrents. Here your trail continues straight, away from yesterday's route and follows one of the routes down from the Annapurna Sanctuary. You trek down past terraces filled with crops and tiny villages, some with shops and restaurants inviting you to rest awhile. All around, the communities hum with activity, each household busy with cooking, washing, cleaning and other everyday chores. As you walk downwards you pass groups of smiling children and a constant stream of villagers, carrying everything from firewood to soft drink bottles in traditional back baskets (dokos), attached to a headband. Buffaloes and goats graze in the surrounding fields and you may have to make way for the donkey and mule trains that convey goods to and from the Gurkha settlements. You may also meet trekkers coming down from, or heading up to the Sanctuary itself. You continue descending, until after about two or three hours you reach Shyauli Bazaar. From here, you follow along the Modi River until reaching the cable bridge you negotiated on your first day. You ascend again, partly on well-paved steps and partly on switch backs, reaching the welcome sign of the Gurung Lodge after about two hours. The Gurung Lodge is built along the lines of a traditional Nepalese village. Every room has antique carved windows and spectacular views of the surrounding valley and mountains. You will have your lunch when you reach here. Day 6 - Trek to Damphus, 1,700m/5,577ft - 3-3½ hours. Continue to the roadhead - 1½ hours. Drive to Pokhara. After breakfast, you say farewell to the ever-attentive lodge staff. Your path climbs steeply on well-placed steps, up through forests of oak, rhododendron, silver birch and silk-cotton, with stone-built porter stops (chautara) at convenient intervals for a welcome rest. There is a mass of bird life to look out for, as well as incredible views of Annapurna South, Hiunchuli and Lamjung. After about an hour, the path begins to level out and you continue more gently upwards, through shady woods and past grassy banks of gentian violets. Eventually, you reach the busy village of Pothana at 1,981m/6,500ft, with its guest houses, restaurants and sellers of Tibetan silverware and other souvenirs. You then descend to the village of Damphus. You will have lunch in Damphus at the Basanta Lodge and enjoy some last close-up views of the Annapurna range. After lunch you start the final long descent to the Pokhara Valley road, passing through steeply terraced fields to reach the road at Khare Khola at 1,006m/3,330ft, where a vehicle will be waiting to take you back to Pokhara. The one-hour journey takes you past a patchwork of rice fields, with farmers working with buffaloes, surrounded by flocks of egrets. You will be taken directly to your hotel where you will have the rest of the day at leisure. Day 7 - Fly to Kathmandu. Afternoon at leisure. This morning you will be transferred to Pokhara airport and will fly back to Kathmandu. You will be met at the domestic terminal and transferred to Dwarika's Hotel. You then have the afternoon at leisure, either to enjoy the facilities of the hotel and prepare for the next section of your adventure or perhaps to take in a bit of sightseeing. The important temple of Pashupatinath is just a 15 minute walk from the hotel. Here you may see Kathmandu's historic cremation ghats set on the banks of the sacred Bagmati River and the major temple dedicated to the Hindu god Shiva. Alternatively, also a short distance from the hotel, you might visit the ancient Buddhist stupa at Boudhanath, visited by pilgrims from Tibet and all over the Indian subcontinent. Day 8 - Fly to Lukla in the Everest region, 2,743m/8,999ft. Trek to Monjo, 2,835m/9,301ft - 5-6 hours. Today you will be transferred to the airport to fly up to the Everest region to continue your adventure. The flight from Kathmandu to Lukla and the landing at the small mountain airstrip is something you will be talking about for many years to come. The scenery is fantastic, and as you fly up the vast valleys towards Lukla, the giants of the world appear on the horizon. After landing, you may have a cup of tea in one of the lodges in Lukla before starting the trek. You descend from Lukla to the village of Chaurikharka in the valley of the Dudh Kosi and then onward up the valley and it is about two hours to the village of Phakding, 2,652m/8,701ft, where you will probably stop for lunch. You will immediately find differences between here and the Annapurna region. Firstly you will notice the altitude and may feel a little breathless. Then you will see that the valley already has more of an Alpine feel with different crops to those grown in the Annapurna region, with potatoes instead of rice, and different trees and bushes lining the path. The trail you walk on this first day is the main trail up to Namche Bazaar. Along the way you will encounter porters, sherpas, trekkers and the local beast of burden, the dzo (a yak-cow crossbreed). You are now in a Buddhist region and you will pass mani walls where stones carved and painted with prayers and sacred symbols are piled up. From Phakding the path continues up the valley past isolated lodges and the small hamlets of Ghat, 2,490m/8,169ft and Chuthrawa, 2,591m/8,501ft. Before you get to Monjo there will be time for tea at Benkar, a lovely lodge in a wild spot. Images you will remember for the day will include the sight of porters with their heavy loads, the sound of many different languages, bird calls, prayer flags, colourful tea houses, dramatic scenery and passing weary trekkers, making their way back to Lukla. Day 9 - Trek to Namche Bazaar, 3,445m/11,303ft - 3-4 hours. This will physically be one of the harder days of the trip so take it slowly. You will leave Monjo and continue to the park gates of the Sagarmartha National Park at Jorsale where you have to complete entry formalities. You then walk on alongside the river to arrive at the confluence of the Imja Drangka and the Nangpo Drangpo, which combine to form the Dudh Khosi. Crossing the river on a high suspension bridge over a spectacular chasm you start the steep climb to Namche. Near the halfway point of the climb, if the sky is clear, your first views of Everest and Lhotse come into sight. You then continue the climb, less steeply now, until you reach the outlying houses of Namche. Namche is the largest and most prosperous village in the Khumbu. Thamserku, 6,618m/21,712ft and Kwangde, 6,224m/20,420ft, loom to the east and west and the sacred mountain Khumbila, 5,707m/18,724ft, dominates the skyline behind the village. The steep, narrow streets at its centre are a mixture of traditional and modern, with Sherpa houses and lodges mingling with cafes, handicraft shops and shops selling or renting trekking and climbing equipment, foodstuffs and vegetables, tennis shoes and Tibetan boots. Don't be surprised if, after the exertion of the climb and the rise in elevation, you feel a little tired and head-achey. You will no doubt feel better after a cup of tea and a rest. Day 10 - Trek to Tashinga, 3,360m/11,024ft - 2 hours. You will be at a higher altitude in Namche than you have been so far on this trip so today is a fairly easy day with just a short trek of less than two hours to Tashinga, a small hamlet lying on the classic route towards Everest. First you have a steep pull up out of the village to reach the Sagarmatha Park HQ and the National Park Museum, set on the hill above Namche. The museum is well worth a visit and from here there are also your first panoramic views of Everest and Ama Dablam - a spectacular spot. You then take a wonderful high trail which winds round the hillside high above the river. From this airy trail you have fabulous views of the mountains across the valley, principally Thamserkhu and Kang Taiga. The trail then drops toward the river, passing the path coming down from the village of Khumjung, to reach your lodge at Tashinga. You may spend the afternoon relaxing in the beautiful gardens and enjoying the views. Day 11 - Trek to Thyangboche, 3,863m /12,674ft and return to Tashinga - 3-4 hours. Looking across the valley from the Tashinga Lodge you will be able to see the path sloping diagonally up towards the famous monastery of Thyangboche. To reach it you first have to descend to the river. This takes between 30 minutes to one hour, descending steeply in a series of zig-zags to the Dudh Kosi River where you cross a suspension bridge in the lee of a gigantic overhanging cliff, 3,200m/10,499ft. A little further on is a small hamlet, Phunki Tenga, remarkable for its series of water driven prayer wheels. You could stop here for a cup of tea. It is then 2-3 hours from Phunki to reach the monastery at a slow and steady pace, stopping occasionally to look at the views or to bird watch. At first you climb steeply up through a pine forest, mercifully in the shade, and then emerge to walk up a more gentle sloping path which rises like a ramp to the monastery itself. Emerging at the top, there is a large welcome gateway and a huge chorten which you pass before you get your first sight of the gompa. The setting of Thyangboche Monastery is nothing short of magical, with the most amazing mountain views. Thyangboche's former temple was in fact burnt down only a few years ago and was re-built largely through the efforts of the Sir Edmund Hillary Trust. There is a very good visitors' centre and you should have time to sit down inside the temple for afternoon prayers, where conch horns are blown, drums are beaten and the monks chant prayers in the main prayer hall. Visitors are welcome but are expected to sit quietly on the right hand side of the temple and a small donation is appreciated! Sadly, it will then be time to leave and return down the trail to the bridge and back up through the forest to your lodge in Tashinga. Day 12 - Trek to Monjo Lodge - 4 hours. Leaving Tashinga you climb to Kangzhuma and then you return to Namche, again enjoying the fabulous views. If your group is feeling energetic you might break your journey to visit Khumjung village with its ancient gompa or take in the views from the Everest View Hotel. You may discuss this option with your guide. You descend into Namche for lunch. After lunch you start the knee crunching descent back down to the valley. The warmer climate will offer a good opportunity to shed a layer or two and breathe the oxygen rich air! You continue down the Dudh Kosi valley for a short way past the checkpoint at Jorsale and on to Monjo. Day 13 - Trek via Gumila Monastery to Lukla, 2,743m/8,999ft - 5 hours. Today you will trek back to Lukla. Many people head towards Lukla with a heavy heart, knowing they are coming to the end of an exceptional journey. Memories of your trip will help you up the deceptively long, final climb into Lukla. You pass through the village of Phakding where you will have a chance to view the monastery at Gumila above Phakding. Within the monastery reside 12-15 monks from the Gelukpa Sect; it is also a Buddhist teaching monastery. It takes about 30-45 minutes to reach the monastery from the main trekking route. From here you will retrace your steps back to Lukla, to your lodge for the night. Day 14 - Fly to Kathmandu. This morning you will take the small fixed wing flight back to Kathmandu, where you will be met on arrival and transferred to the Dwarika's Hotel for some well-earned relaxation. Please note that flights into and out of Lukla are sometimes delayed due to weather conditions either in fog-bound Kathmandu, or windy Lukla; be reassured that our staff in Lukla and in Kathmandu will be doing everything possible to minimise the inconvenience caused if this happens. Your patience in the trying circumstances which can occur, will be greatly appreciated. Your final day of leisure in Kathmandu does of course provide a valuable 'cushion' against missing your flight home to the UK should the Lukla flight be delayed. Day 15 - Morning sightseeing tour of Kathmandu. Afternoon at leisure. Today you will have a day in Kathmandu with some sightseeing and some time at leisure. This day will also act as a buffer in case of flight delays down from Lukla. In the morning you will have an included half day sightseeing tour of Kathmandu, led by an English speaking guide, visiting the Monkey Temple at Swayambhunath and Kathmandu Durbar Square. In the afternoon, there is time to take a taxi to visit the old city of Bhaktapur a few miles to the east of Kathmandu or just to relax at the hotel and reflect on your trip. In the evening you might enjoy a celebratory dinner at the hotel. Day 16 - Group transfer to the airport. Fly to London. After breakfast you will be transferred to the airport for your flight back to the UK. I would highly recommend this trip. The Annapurnas and Everest regions are very different so it was great to do the two treks and experience both areas. The trek leaders and all the support staff were amazing and did everything possible for us. The lodges were very comfortable and food was excellent and plenty of it. It really was a wonderful trip! We really enjoyed visiting the two stunning, but very different, areas in Nepal and having all our logistics taken care of. The warm welcome we received at all the lodges were brilliant and the hospitality first rate. Huge range of adventures all in one trip, with generally the best accommodation available. Bistarai, bistarai - our guide's words as we set off to climb the steep and rugged paths towards Tyengboche at altitude. It worked - the slowly, slowly pace helped us acclimatise and ensured that we enjoyed all the sensory experiences that a trek like this can offer. We gained a precious and tiny insight into life in a wholly different country from our own and were changed by that experience. Unforgettable! This holiday fully lived up to its expectations. We had magnificent walking, magnificent views of Annapurna and Everest - and of course many other mountains - and it really was in style, with a fabulous hotel in Kathmandu and Pokhara, and wonderful lodges on the two treks. The weather was fantastic (though I suppose that was not guaranteeable) - and the group of 11 people were extremely good company (that's not guaranteeable either of course). We are delighted to offer this new luxury stay in a rural location just outside Pokhara. We are sure this is set to become a favourite with our clients. The Pavilions Himalayas is a luxury resort set in beautiful farmland amid paddy fields in a tranquil rural location approximately 5km outside Pokhara. There are dramatic mountain views from the resort as well as Pokhara’s famous Peace Pagoda seen on top of a nearby ridge. The beautiful rooms are set in individual villas and are large and comfortable, all having whirlpool baths, separate rain shower cubicles, enormous beds and offering wonderful hand made soaps and shampoos made with herbs from their garden. All facilities at the resort are top of the range and include a lovely swimming pool and spa. From the resort it is just a short drive to explore Pokhara or there are pleasant walks from the hotel or you can just chill at the resort, have a massage and enjoy the facilities. The Kathmandu Valley has a long and rich history and a vibrant culture and there is much that is worthwhile to see there - crowded bazaars, ancient temples, Buddhist stupas, crumbling shrines and picturesque palaces. The Malla kings who ruled in the valley created three major cities in the valley, Kathmandu, Bhaktapur and Patan and each of these cities has buildings that are showpieces for the art and architecture of local Newari craftsmen. We offer a selection of half day trips and full day trips to these sites the valley. Koshi Tappu Wildlife Reserve is one of the finest birdwatching and wildlife areas in all Asia. Located in south-east Nepal, the reserve covers 175 square kilometres with large expanses of open water created by the Koshi barrage, with marshes, lagoons, sandbanks and mudflats offering an outstanding wetland habitat. The reserve is home to over 500 species of birds, with the resident inhabitants being joined by large numbers of migratory species from Siberia and Tibet, which take up residence from November to February. The Koshi Tappu Wildlife Reserve provides one of the best places in Nepal to view migratory water fowl, waders and shore birds with many species seen here which are not recorded elsewhere in the region. There is also much wildlife to be seen in Koshi Tappu including blue bull, golden jackal, Bengal fox, fishing cat, jungle cat, mongoose, civet cat, porcupine, Indian flying foxes and rare Gangetic dolphins as well as rare Marsh Mugger crocodiles. In addition, Koshi Tappu is the last habitat of the endangered Arna, a type of wild water buffalo. During your visit you will explore the park with bird and animal spotting from a raft trip on the Koshi River, birdwatching walks, jungle walks and jeep trips. You will also have the opportunity to visit a family in one of the very interesting nearby local villages for a taste of rural Nepalese life. The Koshi Camp offers simple but comfortable accommodation and an expert staff of naturalists and birdwatchers to give you a comprehensive introduction to this wonderful area. Built in Dwarika’s own inimitable style the resort offers a relaxing atmosphere of complete harmony in the tradition of ancient Buddhist and Hindu beliefs. The rooms are spacious and luxurious and are set in lovely gardens with inspiring mountain views. Facilities include an infinity pool overlooking beautiful countryside, top of the range spa facilities, a fitness centre, a Chakra sound therapy centre and a Himalayan salt room and meditation room all inspired by a blend of Vedic Philosophy and Buddhist Medicine. The resort offers an impressive range of ayurvedic treatments as well as yoga and meditation and classes. Its wonderful restaurants offer delicious food, sourced locally and from Dwarika’s own organic farm, with delicious menus carefully created to complement Dwarika’s philosophy and treatments. Other activities include lovely walks to visit their farm or to explore the surrounding area and visit traditional villages such as the legendary Namobuddha Monastery or the Newari village of Panauti, to experience the simple joys of Nepalese rural life. Visit some of Tibet's most important historical and cultural sites and monasteries of Tibetan Buddhism. Offers a scenery completely different to that of Bhutan and Nepal. Suitable to add to any holiday flying in/out of Kathmandu. ​A visit to Tibet offers an exciting extension to a visit to Nepal or Bhutan. Regular flights to Lhasa from Kathmandu make it possible to visit most of the major sights in and around Lhasa on an 8 day itinerary and a visit to Tibet will provide an exhilarating contrast to your trek or tour in Nepal or Bhutan. Tibet’s high plateau offers totally different and starker scenery to that of the other Himalayan countries. Here you will see some of the most important historical and cultural sites and monasteries of Tibetan Buddhism – the Potala Palace and Samye, Ganden and Drepung Monasteries. If taking this extension you will need to spend an extra day beforehand in Kathmandu while our agents there process your Tibet visa. They will need your passport for the day for this purpose. You need to let us know in good time if you wish to take this extension as we need to put this process in hand and send your details to the Chinese Embassy in Kathmandu well before your departure date. Why not extend your adventure in Nepal by visiting the beautiful Tiger Mountain Pokhara Lodge. Tiger Mountain Pokhara lodge is a lovely place, situated on a ridge half an hour outside Pokhara and enjoying the most stunning mountain views over the Annapurna range of mountains. The lodge is an ideal base for you to relax in a rural mountain setting, away from the bustle of town. With a central lodge, bar and dining room, the comfortable rooms are arranged in clusters of cottages resembling a Nepali village. All have attached bathrooms, private verandas and Himalayan views. Daily menus feature a range of Nepali dishes as well as continental specialities made from local fresh ingredients and home-grown herbs and garden salads. You may enjoy lovely walks through the forests and villages of the lovely countryside surrounding the lodge, escorted by trained local guides. The beautiful swimming pool reflects the distant white peaks of the Annapurna range. The lodge also offers a range of Ayurvedic and shiatsu therapy and yoga and meditation sessions are also available (at additional cost). You may also venture further afield to visit Pokhara, Nepal’s second city located on a lovely lake and also enjoying spectacular views. Flights operate in the early morning, when weather conditions are at their best. While in Kathmandu, why not experience the spectacular sight of Mount Everest? Instead of trekking into the region to gain a good view of this must-see landmark you could see it in under an hour! We fly with either Buddha Air or Mountain Air who both operate modern Raytheon Beechcraft 1900 aircraft. These hold between 16 and 18 people and as the seating is only two abreast everyone is guaranteed a window seat. The excursion includes hotel transfers, a celebratory glass of bubbly and a certificate signed by your captain after you land. arguably the most magnificent of cats, the Royal Bengal Tiger. You may even see sloth bear, gaur (wild cattle) and crocodiles. Chitwan is also wonderful for birdlife especially in the spring, when the jungle rings day and night to the calls of several kinds of Asian cuckoo. After your adventurous time in the Himalaya why not add a relaxing Jungle Safari to your trip? The Royal Bardia National Park is situated in the west of Nepal. We use Tiger Tops Karnali Lodge, which is acknowledged to be the best lodge in the area. Bardia’s remote geographic location and the fact that the lodge has only 12 rooms, lends a degree of exclusivity to the experience, in comparison to other more popular parks. From the lodge you will be able to participate in safaris and have the chance of seeing some of the country’s wonderful wildlife, for instance, wild elephant, rhinoceros, leopard, deer, wild boar and if you are lucky, the famous Royal Bengal Tiger. There is also the possibility of visiting the villages of the Tharu tribal people that surround the lodge. With its abundant wildlife, relaxing lodge and first class service, our Bardia extension is an experience you will savour! While in Kathmandu, why not experience an exclusive, private, home away from home? Shivapuri Heights Cottage is a “home-stay-style” property that offers a great escape from the hustle and bustle of the City. It is located in 2 acres of land at an altitude of 6,000ft /1,830m on the edge of the protected Shivapuri Reserve, with beautiful views looking down into the Kathmandu Valley. Though only a short flight from Kathmandu, Bhutan offers a very different Himalayan experience to Nepal. Characterised by lush valleys, terraced hillsides and soaring peaks the landscape is endlessly picturesque, whilst the imposing dzongs (monastery/fortresses) and Swiss chalet style houses give each town or village a look that is distinctly Bhutanese. Here are just two options – if you would prefer something different please discuss with this office. This five-day tour visits Bhutan’s key sights and cultural centres including magnificent Taksang Monastery (Tiger’s Nest), the beautiful riverside dzong at Punakha and the fascinating treasures housed in the National Museum at Paro. The tour will be led by a knowledgeable Bhutanese guide and accommodation is in comfortable hotels with all meals included. This eight-day gentle walking trip offers the perfect introduction to some of the cultural highlights and scenic delights of Bhutan. You begin with sightseeing om Thimphu and a walk to Cheri Monastery, one of Bhutan’s most historic temples before travelling over the Dochu La Pass to Punakha, the former winter capital. In Punakha you take a lovely valley walk and visit the beautiful riverside dzong. Driving back to Paro you take a pretty walk from the Dochu La through beautiful forest. You then drive up to the Chele La Pass and take the lovely walk to Kila Nunnery, before ending your trip with the walk up to Tiger’s Nest Monastery, Bhutan’s greatest cultural treasure and a fitting conclusion to a superb extension. You will stay in good quality, comfortable hotels throughout and all meals are included.